Chloe Nofziger of Archbold was one of three Bluestreaks named first team All-NWOAL. She was joined by teammates Andi Peterson and Madison Gigax. 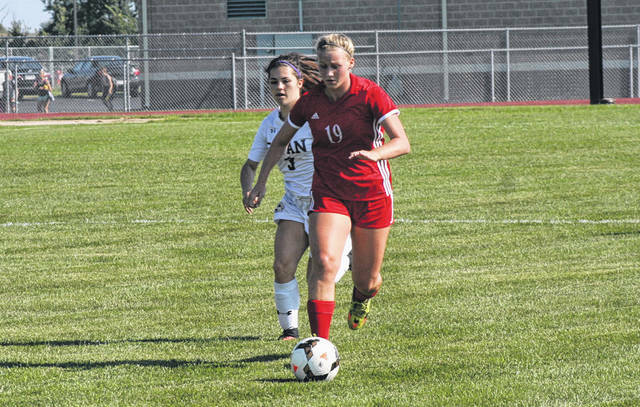 Daisy Giguere races upfield for Wauseon in a match this season. She made first team All-NWOAL for the Indians. Asia Gensch of Evergreen, left, and Madison Gigax of Archbold fight for possession during a regular season contest. They were both named first team all-league. 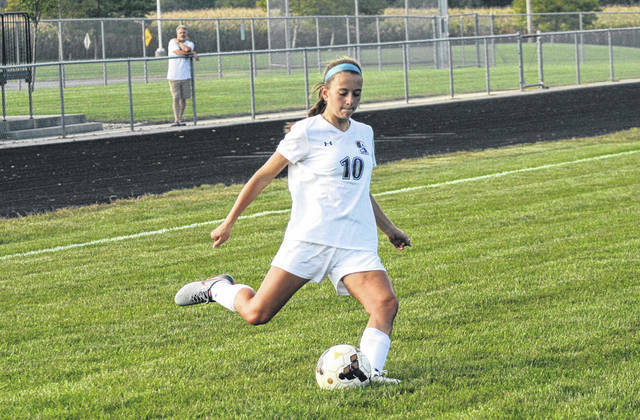 Local athletes frequented the Northwest Ohio Athletic League all-league girls soccer list that was released recently. Co-players of the year in the league were Andi Peterson of Archbold and Samantha Engler of Liberty Center. Also receiving first team honors for the Bluestreaks were Chloe Nofziger and Madison Gigax. Regan Ramirez and Reagan Kohler were second team all-league for Archbold. Evergreen had a pair on the first team as Asia Gensch and Paige Radel were selected. Emma Bettinger was second team all-league for the Vikings. First team all-league for Swanton were Bridget Harlett and Morgan Pine. Twin sisters Aricka Lutz and Averie Lutz received second team honors. For Wauseon, Daisy Giguere was named to the first team. 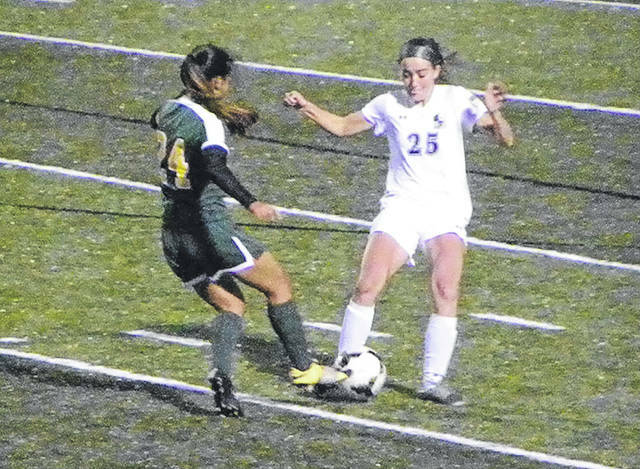 Mya Suarez was second team all-league for the Indians. Delta had no one on the first team, but Jessie Giguere and Alayna Mitchell were second team all-league. Andi Peterson, sr., Archbold; Samantha Engler, soph., Liberty Center; Bridget Harlett, sr., Swanton; Chloe Nofziger, jr., Archbold; Asia Gensch, jr., Evergreen; Megan Voigt, jr., Bryan; Hailey Craft, sr., Liberty Center; Madison Gigax, jr., Archbold; Paige Radel, fr., Evergreen; Jillian Hoffman, soph., Liberty Center; Morgan Pine, jr., Swanton; Daisy Giguere, jr., Wauseon. Player(s) of the Year: Andi Peterson, Archbold; Samantha Engler, Liberty Center. Coach of the Year: Dave Busick, Liberty Center. Kayla Arnold, sr., Bryan; Regan Ramirez, soph., Archbold; Jessie Giguere, sr., Delta; Savannah Jenkins, sr., Liberty Center; Aricka Lutz, soph., Swanton; Reagan Kohler, fr., Archbold; Mya Suarez, sr., Wauseon; Averie Lutz, soph., Swanton; Emma Bettinger, jr., Evergreen; Alayna Mitchell, sr., Delta; McKenna Grube, sr., Bryan; Riley Miller, jr., Liberty Center. Delta: Courtny Helton, Cassandra Lee, Anna Munger. Evergreen: Annabelle Hughes, Anna Huntzinger, Sydney Woodring. Swanton: Frankie Nelson, Grace Oakes. Wauseon: Kadence Carroll, Anna Koenig, Briley Rupp, Amanda Wendt.